Bagatelle, "Tropical Seafood, Southern Charm" A visit to our house is a unique way to relax and enjoy life's simple pleasures as well as our treasures from the sea. The word Bagatelle comes from the French and means "a trifle or a little nothing", often referring to a light, fun, yet not too serious spring time romance. The French brought their history of fine cuisine and their love of wine to the Caribbean Islands. It is in this tradition that we have combined our French heritage, southern hospitality and the indigenous tastes of the Florida Keys. Our chefs blend the best of our locally caught fresh seafood, fresh produce and delicious tropical fruits for our tropical seafood dishes. The house was built in 1884 by Sea Captain Fredrick Roberts who raised his family in it. Returning from his travels, Captain Roberts looked forward to joining his family and good friends for the wonderful meals served on the porches. We have retained much of the original charm and architectural detail of the original Bagatelle building. The expansive wrap around porches are designed to take advantage of the prevailing tropical breezes of Key West. 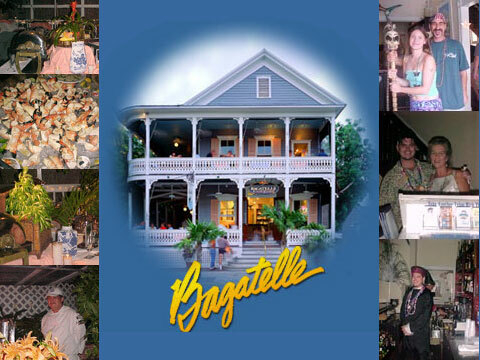 Located on Duval Street in the heart of Old Town Key West, Bagatelle is a great place to watch the steady parade of visitors & locals alike. Welcome to Our House!